(Oct. 2, 2018) — The Forest Preserve District of DuPage County urges drivers to slow down and stay alert to avoid deer-vehicle collisions this fall, when the animals’ breeding season increases the risk of accidents. “Deer-vehicle collisions increase dramatically between October and December as deer cross roads and highways more frequently in search of mates,” said District ecologist Brian Kraskiewicz. 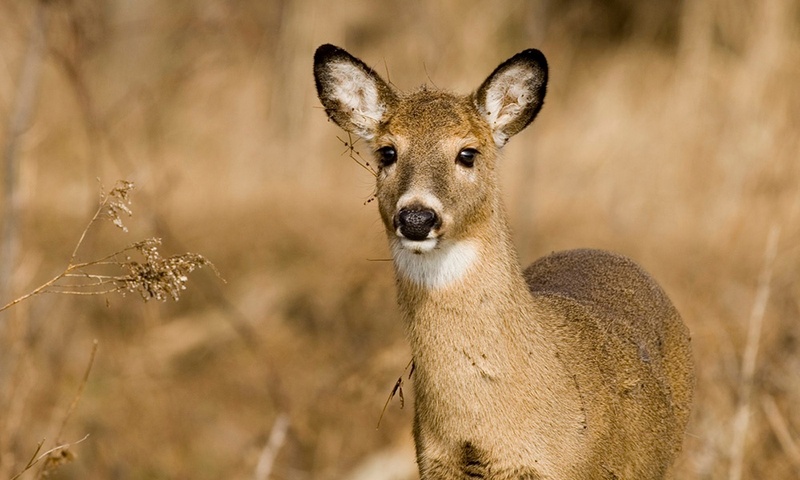 “During this fall season, please remember to slow down and stay alert for deer, especially when driving around the perimeters of our preserves or any wooded areas,” said Forest Preserve District of DuPage County President Joe Cantore. According to State Farm Insurance, Illinois ranked 32nd in the nation for deer-vehicle accidents in 2017. A driver in the state had a 1-in-200 chance of having a collision, a drop of 1.9 percent over 2016. Most deer-vehicle accidents in the U.S. occur in October, November and December. But there are ways to lower the risk. Reduce your speed and watch for deer on the edge of the road, especially at dawn and dusk. They’re common along woods, fields, fencerows and waterways, but you can encounter them almost anywhere. If you see a deer cross safely in front of your car, slow down and expect more to follow. Deer often travel in groups. Make note of where you’ve seen deer before. Be careful when going around curves or when approaching favored deer crossings. Don’t assume that a deer in the road will run off as you approach. They may bolt or quickly change direction without warning. Don’t use your horn unless it looks like you are going to collide with a deer. Distant noise may confuse the deer. Close noise may produce an extra burst of speed from the animal, but there is no way to predict how a deer will respond. Heed deer-warning signs. They are placed in areas where deer-auto collisions are likely to occur. Do not swerve to avoid deer — it could result in a more severe crash. Slow to a stop and wait. Flash your headlights to encourage the animals to move. If an accident does occur, drivers and passengers should not attempt to remove dead or injured deer from busy roads. Instead, they should contact local law enforcement for help. Illinois law requires drivers to report to police any deer-related accident that has more than $1,500 in damage.